Just below the star Deneb in the constellation Cygnus is the aptly named “North American Nebula.” This massive emission nebula is a cloud of ionizing hydrogen lit up by the nearby star Deneb. Due to some lucky fog placement, my local dark site went from an Orange zone to a Green zone in a matter of minutes. 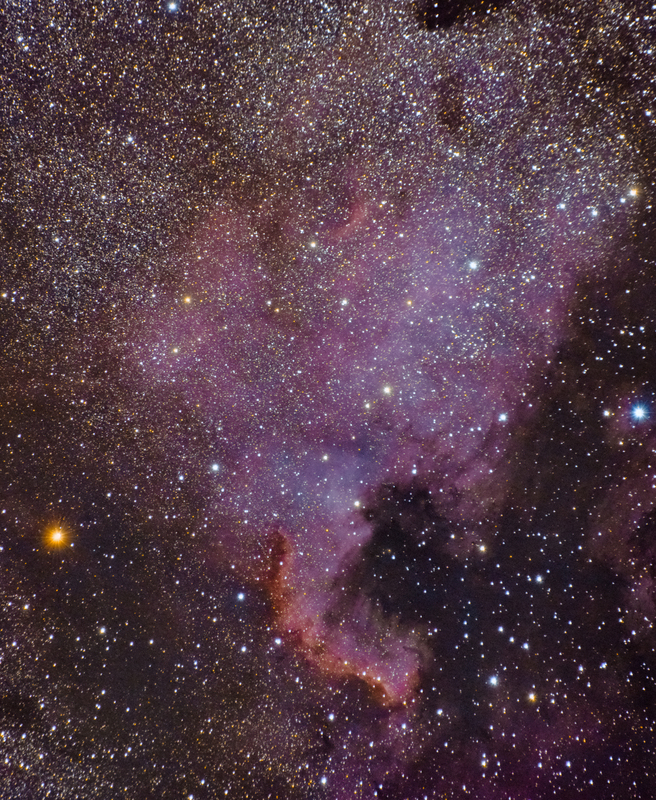 I decided to use the opportunity to shoot this faint star-forming region in Cygnus. 19x300s iso 800 Stacked in DSS processed in Pixinsight, Ps cs2, and Lightroom 5. As you can see, the lens I was using is not really suited for ap. I had perfect tracking, and the stars at the edges are warped to hell and back. I’ll probably be sticking to my ed80sf from now on, seeing how bad the lens is, even when it’s stopped down. Just beautiful and suitable for framing. You are amazing and a true genius! Just beautiful and suitable for framing. You are a true genius!